At the South By Southwest festival (SXSW) you can obviously get to REALLY BINGE on movies, and that means real movies, shown on - gratifyingly - the big screen. You may have been drawn to the festival - as I was originally, close to a decade ago - by the interactive part of the Ffestival, but you'll hardly fail to be attracted by the vast range of movies on offer. (And we can't miss, either, the tsunami of more music than ever deluging Austin, since SXSW Music long pre-dates both the other two divisions and noisily underpins the whole sprawling event). But let me single out just one film - and a short one at that. A watchword at "South By" in recent years has inevitably been "convergence", usually meaning between film or video and the Internet. And the movie that struck me most this year was The Last Mile, a film that centers on the Internet - or to be precisely accurate ... an attention-grabbing total lack of it. 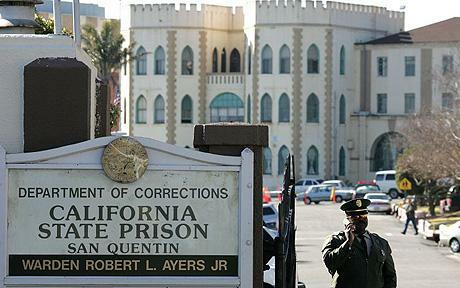 It's a documentary short set in California's infamous and oldest prison, San Quentin. There, amid many features and facilities that are desperately antiquated, authorities have long looked askance at the Internet. And with security concerns always the penitentiary's first priority, online communication has never - unsurprisingly - been made available to inmates. But for some inmates - those in a special training program called "The Last Mile" for long-term prisoners nearing their release date - something quite extraordinary has happened. But the astonishing fact of life for "The Last Mile" participants is that they have to learn the essentials of modern-day business practice without any of them being allowed to use the Internet, or indeed a computer or a smartphone. During the years while many of these convicts have been cut off from such now-quotidian communication tools, ordinary life and interpersonal contact - and day-to-day commerce, perhaps more than anything else - have been revolutionized beyond recognition by these tools. The pre-release prospects have been taught how to blog and how to tweet... as well as how to create code in various computer programming languages, to set up e-commerce ordering and fulfillment systems, and to employ social media in marketing. The nearest the participants actually get to cyberspace, however, has been to write out their "blogs" on paper (special prison administration-approved forms were created) which would be entrusted to volunteers outside the prison walls for uploading. In return, comments and responses would be delivered back to them (robbed of their usual instantaneous quality, of course) in due time, on paper once again. This patient - and I would think dauntingly frustrating - kind of dedication has been rewarded by remarkable success. Graduates of the program are featured in the movie as they come out of San Quentin and set about the process of turning their training into actual practice - and very effectively so in many cases. At the film's first 'South By' screening, I met Kenyatta Leal, previously sentenced to life imprisonment for arms possession as a felon - the culmination of California's Three Strikes rule. He's now marketing his "Coach Potato" app, enabling self-confident amateur experts in play strategies - "any crazy sports-fan" in other words - to interact with games in progress, in real time. Leal is also fortunate enough to have found a regular job in tech - he's Manager of Campus Services with RocketSpace Inc., a San Francisco outfit that provides workspace for start-ups, and also bootcamps for hopeful technology developers. Like many Last Mile graduates, Leal is eager to pass on his learning to benefit others like him. "I recognize the redeemable qualities of men in San Quentin", he told me. "I can change my life so that I never do harm to another human being again. I can also use my experience as a vehicle to help other incarcerated men understand that change is possible." The movie The Last Mile echoes and dramatically amplifies that message for our over-criminalizing society - and does so in a few short, powerful, sixteen minutes. Watch it here. The film is expertly drawn together by director Ondi Timoner, and benefits from being co-produced by Wired magazine and the film and TV division of the Condé Nast media organization. Read more of David Tereshchuk's media industry insights at his regular online column, The Media Beat at its new site. The Media Beat Podcasts are always available on demand from Connecticut's NPR station WHDD, and at iTunes.